If you want to keep your bike, you need to learn how to lock your bike. In this post we look at how people lock their bikes on campus and how not to lock your bike. Click here to read our post on how to lock your bike, complete with pictures! I mentioned in my previous article on bike theft that the next article to be posted would be on locks. The reasons for this are probably pretty transparent. Bike locks are the key (Ba dum chaa! Get it? Get it?) to lowering the likelihood that your bike will be stolen. It’s a fact that no matter the lock, someone with the resources and the time can break into it; however, the better the lock, the more time and effort it will take to break into and the less likely a thief will be to risk the time and noise required. Locks, then, are not so much about securing your bike so much as they are about making it look like a less appealing target. The main message of this piece is the following: All bike locks are not created equal, nor are all ways of securing your bike to a fixed object. If you are in the market for a new bike then visit our shop. We have great bikes for great prices. There are two major types of bike locks that are used here on campus: cable and U-locks. Cable locks are flexible strands of metal, plastic, and rubber that are strung through your bike and around some sort of (hopefully) unmovable object. They have a number of advantages: (1) they’re relatively inexpensive, (2) they’re relatively light, (3) they allow for more flexible attachment, and (4) they are easy to carry on your bike. Despite this, they are extremely easy to remove. All one needs is some sort of cutting implement (which could be as basic and available as a pair of garden shears) and the bike can be gone in ten seconds. U-locks are solid u-shaped bars of metal that attach together, locking in place part of a bike and some other object. While somewhat heavier and more cumbersome than cable locks, U-locks significantly minimize the chance that someone will be able to remove your lock. In an interview about bike theft, Capt. Roy Acree of the University of Illinois at Urbana-Champaign PD noted that those bikes that are stolen tend to use cable locks (or not be locked at all). The disadvantages of U-locks are a result of their advantages. While you have less freedom for how you will attach it to your bike, potential thieves also have less space to work with when breaking the lock. Additionally, its weight is a side-effect of the strong, solid metal construction. To break into these, you really need an electric cutting implement. Additional types of locks are chains, which are similar to cable locks, except in the case of the high-quality heat-treated locks. There are loads of other innovative locking methods out there, beyond these two major categories, too. For a look into how easy it is to break into a bike lock, check out this review and test of various types. The bottom line is this: Your first line of protection against bike theft should be using a good lock and using that lock properly. Neutral Cycle has U-locks available starting at $26. 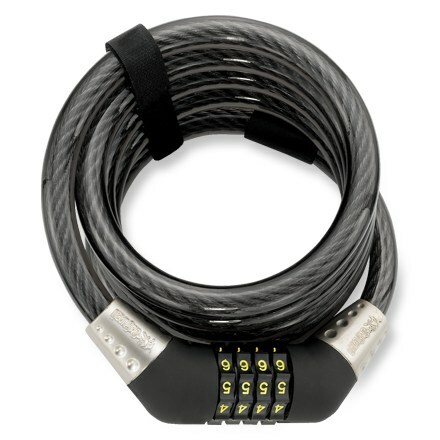 If you have a cable lock, come by our Campustown location at Green and 5th and get something that will effectively lock your bike. Taking inspiration from this video, made by a NYC bike mechanic rating people’s method of locking bikes, we will do the same to bikes I’ve seen and photographed around campus. By looking at others’ failures, it is hoped that you will be more aware of how and how not to lock up your own bike. Ratings are based on (a) what type of lock is used and (b) how much of your bike is secured and how secure the object that it’s attached to is. Given our love of stats, Neutral Cycle wanted to get an idea of what locks people were using and how they were locking their bikes on campus. To do this, I surveyed two sets of bike parking racks on campus: one on the southeast side of the Illini Union and another on the southwest side of Altgeld (Labeled ‘Quad’) and two located to the south of ISR (Labeled ‘Dorm’). For the purposes of these stats, bikes locked with flimsy chains were included under ‘Cable’, and bikes locked with both a U-lock and a cable were included under ‘U-lock’ provided the U-lock itself was connected to a rack (otherwise it’s no more worthwhile than a cable, really). In total, I surveyed 298 bikes – 151 on the Quad and 147 at ISR. So the numbers reveal that about half of the campus uses U-locks, while the other half uses cable locks. At ISR, students were less likely to use U-locks as compared with students on the Quad. (I don’t know if this is significant; if anyone wants to bother checking, feel free!) The most striking difference between the two locations was that students at ISR were much more likely (13% vs. 7%) to lock just their wheels to the bike rack. Doing this leaves your bike much more susceptible to theft because a thief could either unscrew it or, in the case of quick-release skewers, merely flip a lever and get the rest of your bike. Overall, it’s clear that perhaps the majority of bikes on campus can be easily removed with either the help of bolt cutters or a wrench in less than a minute. I looked at both locations because I had a suspicion – which was confirmed by the data – that bikes were particularly poorly locked at dorms. I think the reason for this is that people parking their bikes on the quad tend to actually use their bikes – I mean, they had to ride their bike to the quad, at least. They care about their bikes not getting stolen and are more knowledgeable about what locks to use and how to use them. Many students at dorms, on the other hand, don’t use their bikes. Those bikes were carted to UIUC by their parents and left poorly locked to rust in a dorm bike rack. This may account for the high level of theft at some dormitories, most notably ISR. Bike theft on campus will continue no matter what and so long as people lock their bikes poorly, there’s little reason for it to decline. That said, loads of bikes are out there, totally unlocked, merely propped up (or not) against a wall or a bike rack. In fact, one has been outside our store for the past week and a half like this and has yet to be stolen. This indicates that, although bike theft is a serious issue and although you should always take precautions to lock up your bike, it’s not that bad of a problem and certainly comes nowhere close to the level that you see in cities like NYC, San Francisco, or Chicago. This is great research Kevin! It’s incredible that 50% of the students depend on cable locks to protect their bikes. There is a report that suggests that up to 90% of stolen bicycles were “secured” with cable locks. Thieves know they are rubbish and specifically target bikes locked with these locks. But most people don’t realize this and buy them because they’re cheap, light, long, easy to use and sold as adequate bike locks in otherwise respectable shops. I built The Best Bike Lock to try inform people about the fundamental problem with cable locks and to suggest better alternatives. Sure, you wont find an alternative that offers all the advantages of cable locks, but you will find locks with some of these advantages and most importantly: they will also protect your bike! Nice! This is really useful. In our shop we do our best by discouraging the use of cable locks as anything more than a supplement to a U-lock or a chain lock. We even have a cable we use to demonstrate how easy it is to snap. To be perfectly honest, this is the best researched and most data-driven analysis on local bike theft I have seen in awhile. I am so overwhelmingly appreciative of this level of effort that I’m likely to deal exclusively with Neutral Cycle as my LBS when I arrive on campus. Again, thank you for the work you put in, it’s top-notch. Thanks for the complements! We enjoyed putting this together. If you’re interested, check out some other blog posts where we’ve tried to put together stats about bike theft, accidents, etc. Hey Man, I actually had a number of bikes stolen up at school. I went to MSU. Each time I used a single U-lock. I thought those things we indestructible. But rumor had it, kids were using compress air to freeze the locks and then smash them with heavy hammers. Not sure if this was true or not or even possible, but I started taking my seat into class with me and using a heavy chain and padlock weaved through every bike opening. No thefts after the change. Great article BTW. Thanks, Lee! If someone has the right tools they can definitely bust into essentially any lock. It’s all about making it harder and take longer to bust into, so by taking off the seat and locking it up like that you made your bike a less appealing target.